As previously posted, Blythe has landed in the Pages of Spur magazine representing the fashion brand Bottega Veneta. 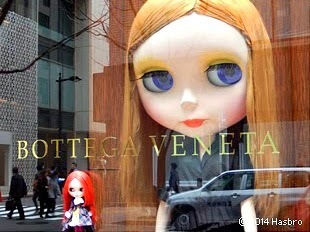 The special Life Sized Blythe Dolls featured in the editorial take center stage in the Visual Display Show Windows of the Bottega Veneta Ginza store from Monday February 3rd - 17th. 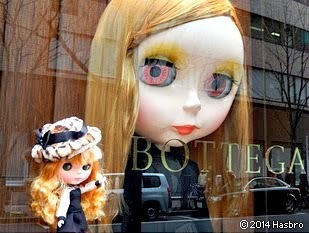 The Blythe display will travel to the Omotesando location Staring February 17th - March 2nd. If you are in Tokyo, this is a must see. Oh ! What a shame! I'm going to Tokyo in may :/ so I'll miss it. Oh wow, so awesome. Too bad you will just miss it. I was invited to go at the end of April. I am a bit apprehensive because of the radiation from Fukushima. I am going to be part of an exhibition at Junie Moon in Japan. If you go please take some photographs of my girls, they should be there till May 11th.